Committee members: Tammy Webb, Claire Benson, Antony Johnson, Kim Herbing, Jackie Coombes, Kathy Tucker. Helpers: Katrina Bulter, Hayley Williams, Alison Cook, Carey Lam, Sandie Phillips, Jen Millar, Helen Shanklin, Lisa Slater, Kirsten Crawford, Rachel Young, Serena Harris, Ann Gill, Polly Middleton. A group of people including parents, teachers and friends of the school who help to organise events, both fund raising and social. What are the aims of The Trinity PTFA? To raise funds to buy things that will benefit the children, that the school could not otherwise afford, to organise social events for children, parents and their friends, to foster community relationships at The Trinity CE Primary Academy. Anyone who has children at the school or who works at the school is automatically a member of the PTFA. Each year in September there is an Annual General Meeting (AGM) to which all parents and staff are invited. This is a good way of meeting people for the first time and hearing about the PTFA achievements and plans. Committee Meetings are held roughly every term in the evening but you don’t need to be a member to help out. Come along to a meeting to find out more. In the informal atmosphere, the committee openly discuss activities and generate new ideas. It is at these committee meetings that school projects are considered with a view to PTFA Funding. In joining the committee, this is your opportunity to have your say. Committee meetings generally start at 6.30 pm and last for just over 1 hour. They are usually held in the Creative Arts Room. Being a member of the PTFA will give you lots of pleasure and enhance your family’s relationship with the school. Mums and Dads, Staff and friends all combine as individuals to form a friendly school community and as Year 6 parents leave the school, so new Reception parents join. Everyone is made welcome at any stage through their involvement with the school and it is never too late to get involved. We are always on the lookout for new members with new and fresh ideas or helpers to run a stall at a fete for half an hour. Whatever you can put in – it will be appreciated. The easiest way to contact us is to leave a message with the school Office and a PTFA member will contact you. 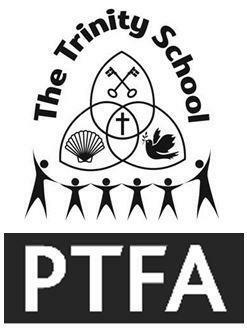 Over the years the generosity of all those associated with The Trinity has enabled the PTFA to donate many thousands of pounds to worthy projects. People have been very creative in coming up with new ideas to run alongside the tried and trusted events. We have a friendly relaxed approach to our meetings and welcome anyone to come along to see for themselves. It is not all about raising funds all the time. The social events are equally important and give the children and adults the opportunity to enjoy many friendships at The Trinity. The school Disco, for instance, is very popular for all the children and the annual Summer Party and Summer Fayre are great days out for everyone. The Trinity PTFA has a remarkable record when it comes to fund raising. You can be part of this successful team.